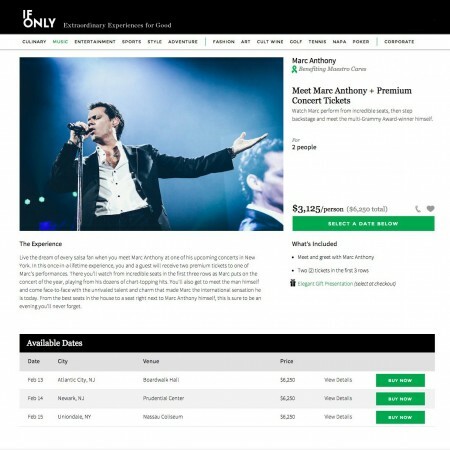 Live the dream of every salsa fan when you meet Marc Anthony at one of his upcoming concerts in New York and New Jersey. In this once-in-a-lifetime experience, you and a guest will receive two premium tickets to one of Marc’s performances. There you’ll watch from incredible seats in the first three rows as Marc puts on the concert of the year, playing from his dozens of chart-topping hits. You’ll also get to meet the man himself and come face-to-face with the unrivaled talent and charm that made Marc the international sensation he is today. From the best seats in the house to a seat right next to Marc Anthony himself, this is sure to be an evening you’ll never forget. Click HERE for more information on how you can bid on this auction for your chance to meet Marc!